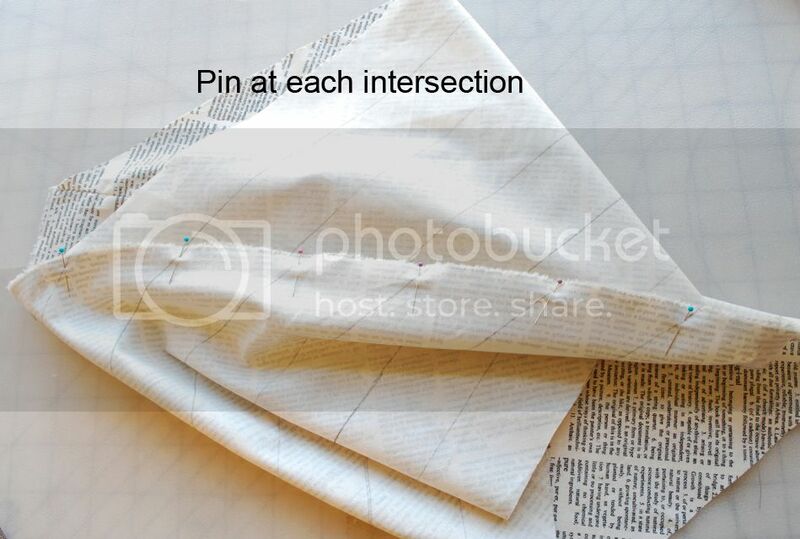 Turn one fat quarter into 5 yards - Stop staring and start sewing! 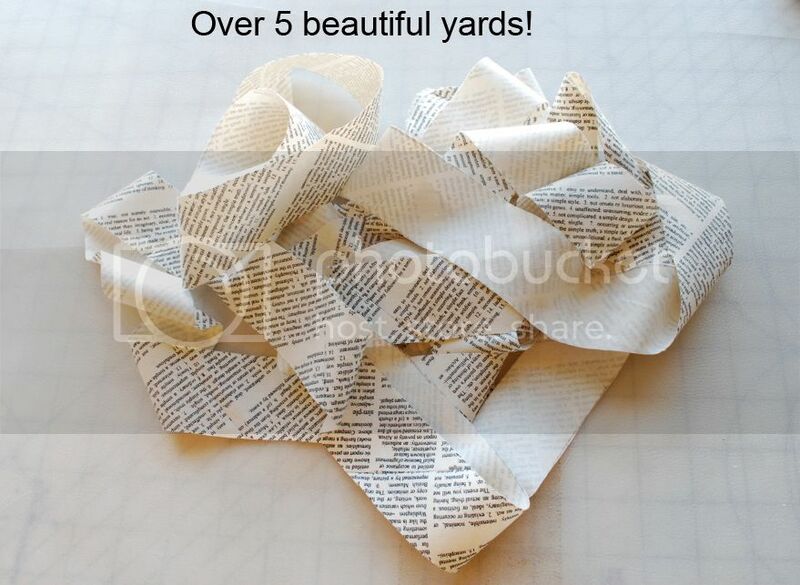 5 beautiful yards of bias tape that is! I discovered this method a few months back and it rocked my (small, fabric-centric) world. The way I always did it required cutting the first triangle off but then I was stuck with this wasted triangle. This method uses that triangle so there's no waste. The instructions I saw used a big piece of fabric and I wondered what would happen if I used a piece as small as a fat quarter. I was thrilled when I got over 5 yards of bias tape out of it. So I'm going to share it with you and maybe you will be as changed as I was by this. 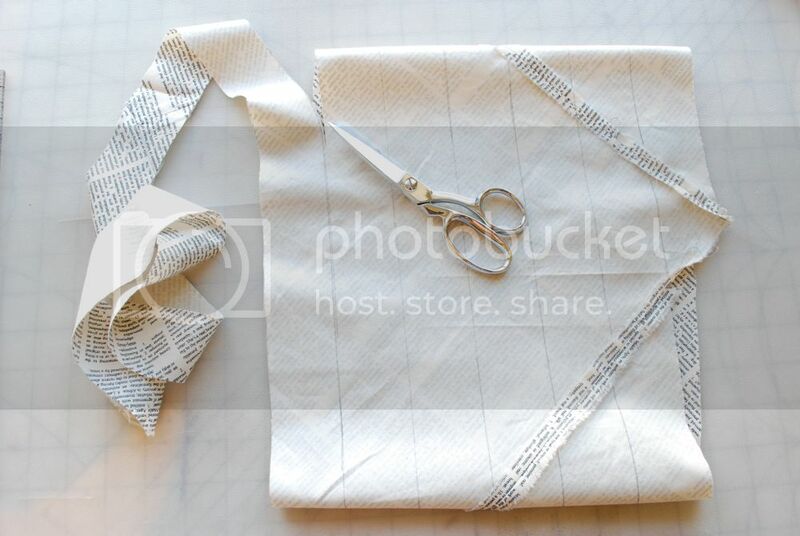 Okay, so you start with a fat quarter (remove the selvage). Lay it flat on your work surface. 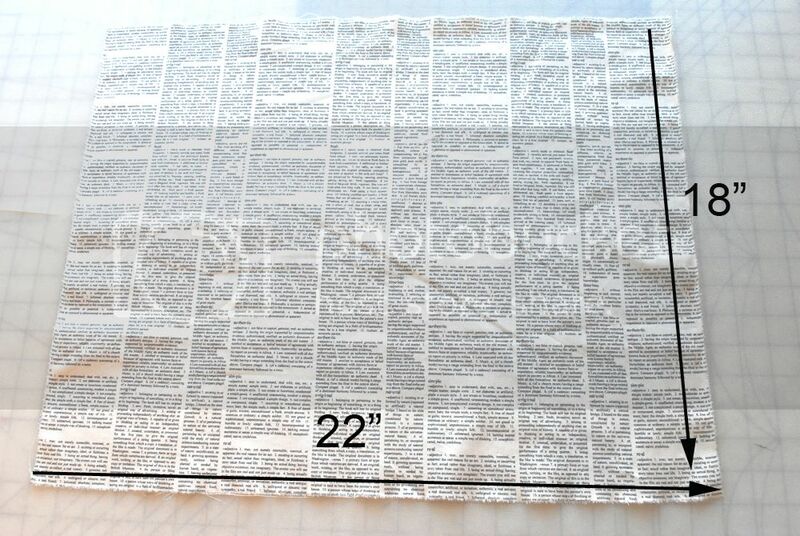 Oh, and I know this looks like it's newsprint but it really is fabric (Au.then.tic by Sweetwater). I think it's pretty nifty and it's going to look cool when cut on the bias. 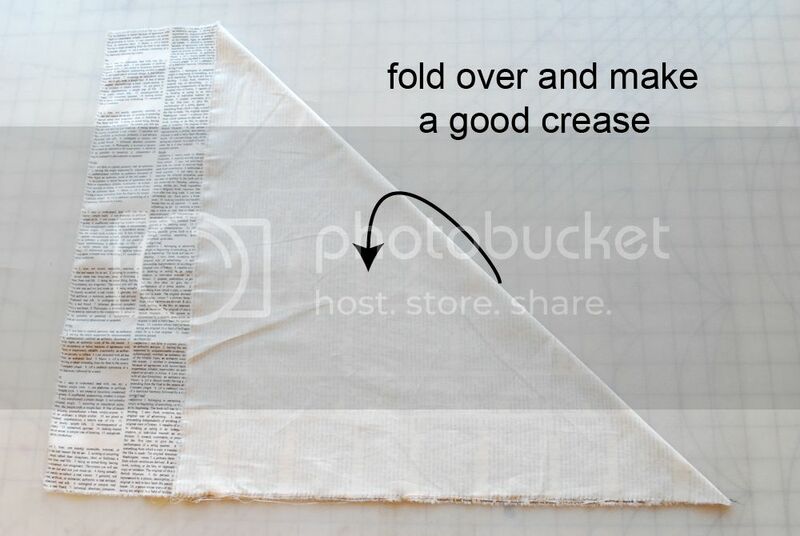 Okay, so fold it over and crease the fold (just run your finger up and down the line hard enough so you can see the crease when you unfold it). 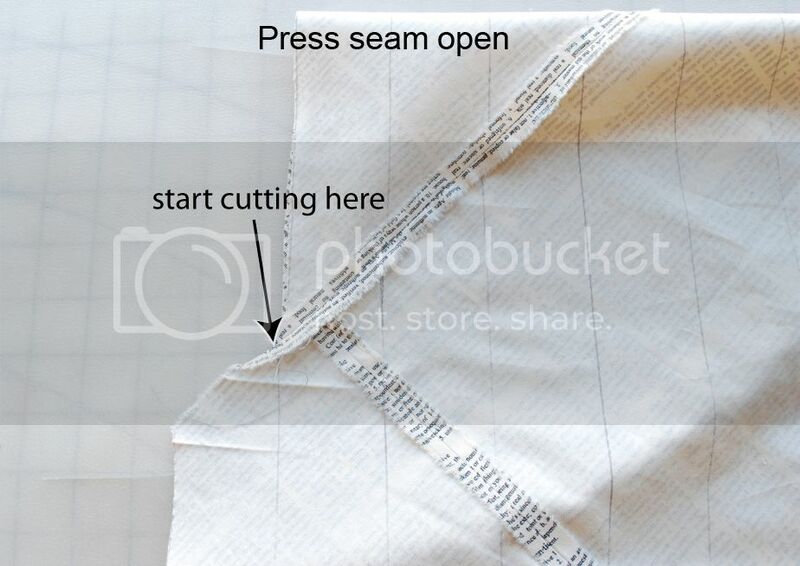 That crease is your cutting line so cut along the line. 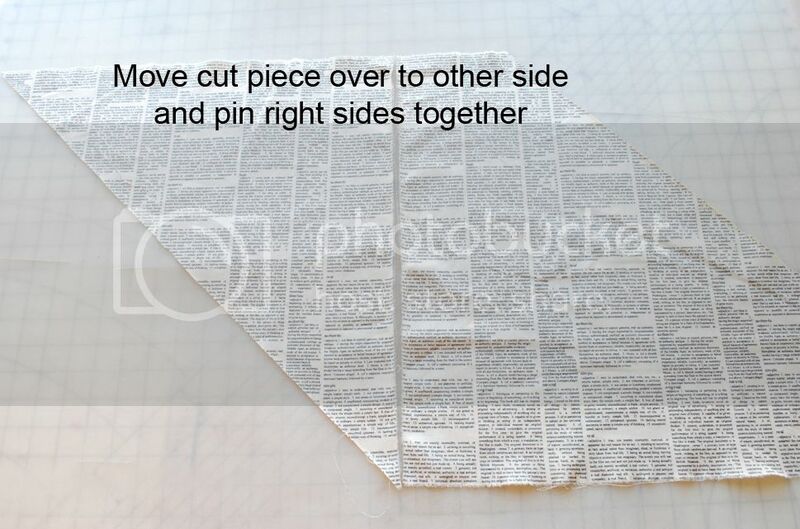 Use your rotary cutter to keep it nice and straight if you have one. 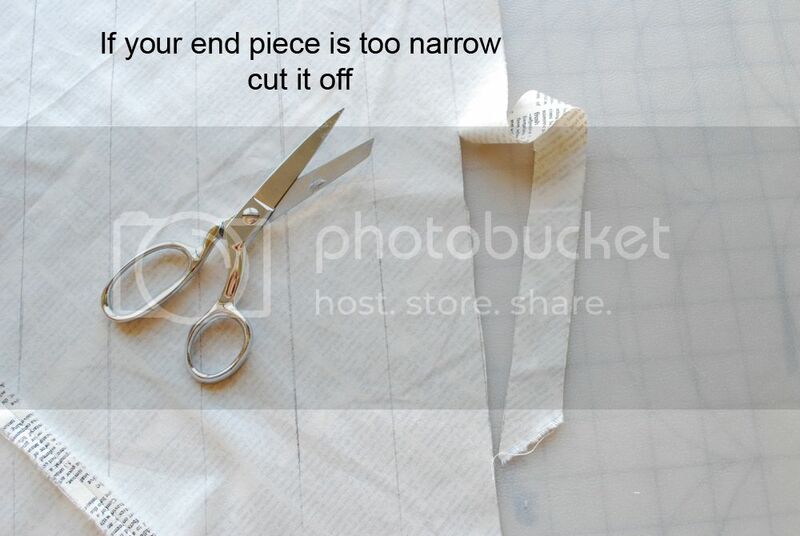 Move your newly cut piece over to the other side. Pin the pieces (right sides together). 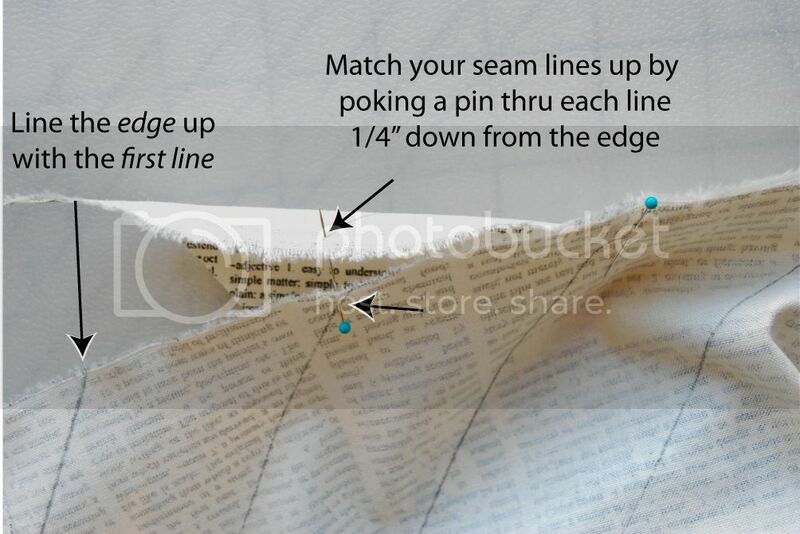 Now stitch them together using a 1/4" seam. Use a short stitch length (I set mine at 2) because you will be cutting across the seams and you don't want them to come apart. You now have a lovely parallelogram (and who wouldn't want a lovely parallelogram?). 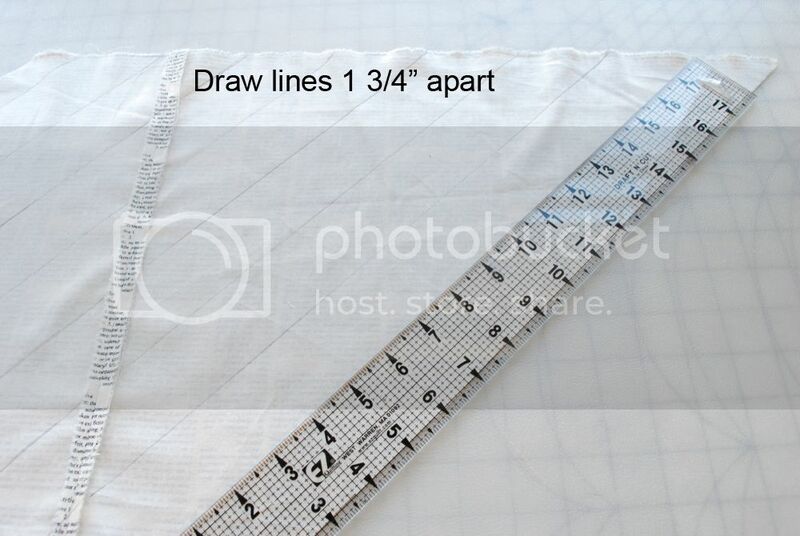 Okay, now take a straight edge and mark lines 1 3/4" apart all the way across your fabric. 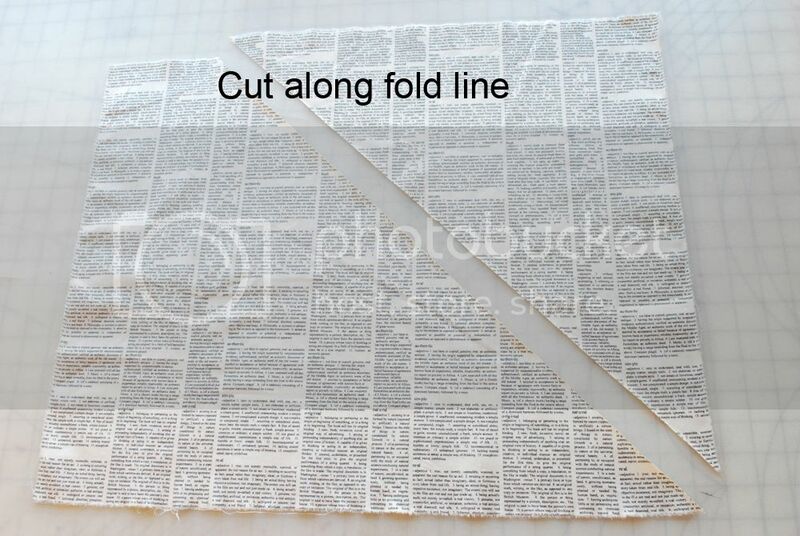 If the end piece is too narrow (it probably will be) then cut it off so all of you lines are equally spaced. 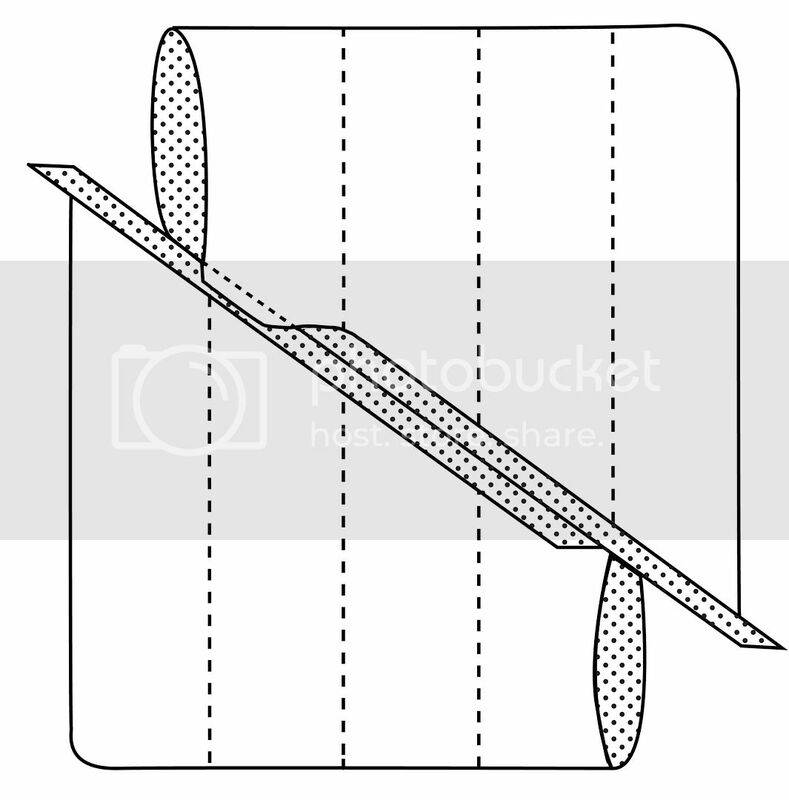 Now you're going to fold your fabric (right sides together) so your lines match up (your basically making a tube). Your fabric will sort of twist while you're this but keep on going. You want to slide one side over so that the first drawn line meets up with the raw edge of the other side (see drawing in next picture down to get a better idea). Pin your sides together making sure the lines will meet at the seam (I stick a pin in through the lines 1/4" down and meet it up with the line on the other side, then pin together). You'll have more than 4 rows but this gives you an idea of how it goes together. You'll have a pin at each intersection but you can use more if you want. Remember, pins are your friend. 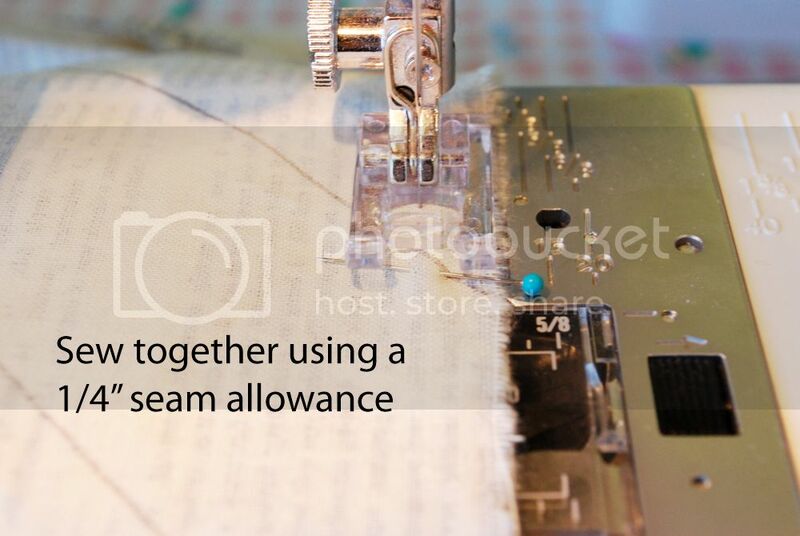 Now stitch it together using a 1/4" seam allowance (again, use short stitches). 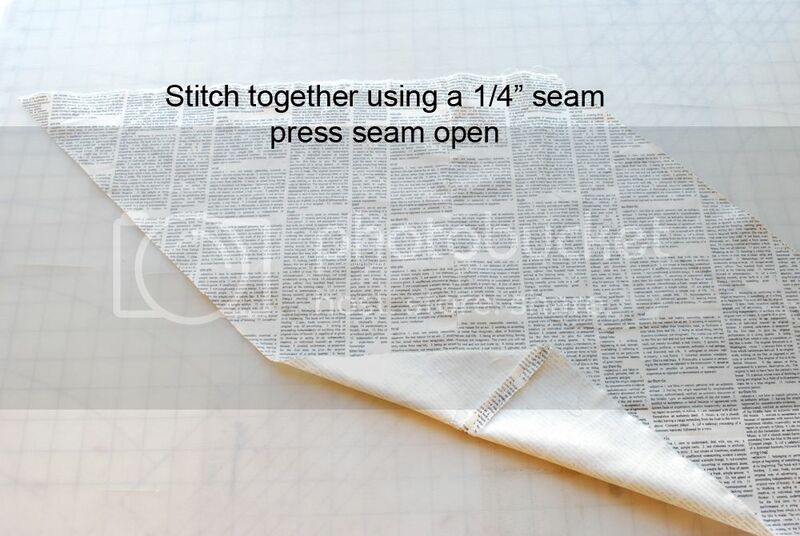 Press your seam open. You should have something like this with one edge off to the side. Start cutting along the line there. Keep cutting. It will "unravel" in one long strip (sort of like an orange peel). ...make some beautiful, one of a kind piping for many more projects (which is what I'm doing!). So give it a try and tell me what you think! 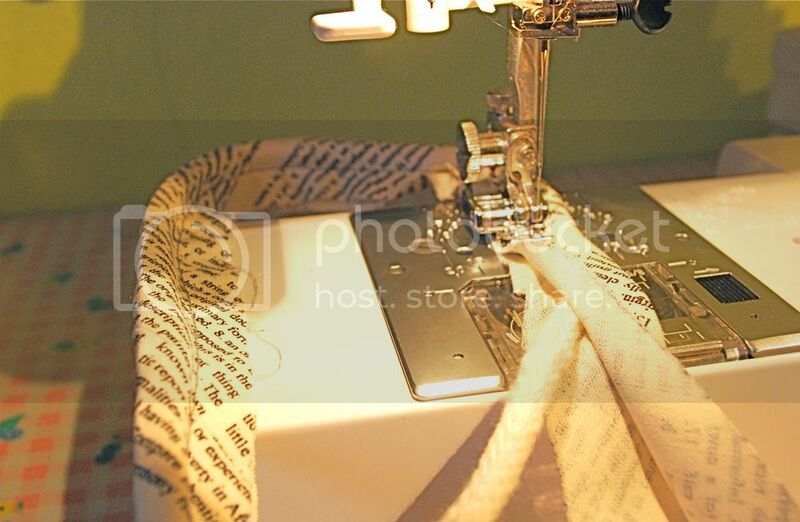 Bias tape is so much more fun when it's made from a great fabric (and a bargain too)! A huge thank you to the reader who pointed out the genius who developed this method (or at least perfected it! ).